Arabic Nation Egypt has a big network of public transportation with a number of buses, minibuses and a large network of roads in addition to the ring road which encircles the major parts of Cairo. The Ideal and best places to find transport to almost any place in the city are Ramsis Square and Abd El Moneim Riyad Square. You can visit the places and ask for your destination and as people are very friendly, they will help you. There is enough bus companies which provide a number of handy routes that link the big cities to just about everywhere else in the country. Travelling for a long journey can often take several hours longer then scheduled due to hold ups at police check points and flat tyres on the desert roads. Although the idea of using public transport in Egypt sounds impossible to some, with some insider knowledge it is easily done. Buses serves the capital, run by the government companies (Governmental Transport Organization), and (Greater Cairo Autobus Co) from about 05.30 to 01.00 daily. They are frequent but well patronized to the point of bursting and during rush hours it is often a case of entering where a space can be found, speed is essential. The number of the bus and the destination is written in Arabic on the front in the space above the driver. In Egypt there is a plenty of government owned bus companies which compromise an extensive network of routes. The long distance service is quite popular with both locals and tourists, and during peak season tends to get quite crowded with tickets selling out fast. Most buses are comfortable, with the exception of some which blast loud videos throughout the journey. This type of buses connect main destinations throughout the country. Most have a strict no smoking rule, some buses on long routes have toilets, Full A/C services, though they are seldom very clean. On longer routes they have a 15 to 20 minutes stop every three hours . They have on board entertainment like Television services and Music system, Earplugs are a good idea if you want to sleep, as is an extra layer, as overnight buses can often be very cold from the A/C. 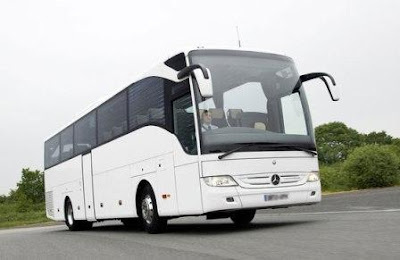 This is the cheapest type of buses on long routes, and most on shorter routes, can be markedly more uncomfortable, overcrowded and noisy than long distance deluxe buses, and stop frequently. For trips under two hours or so, minibuses or servees are usually preferable. There is also several of the biggest Egyptian cities have bus systems. Practically speaking, you might use them only in Cairo and Alexandria. They are not particularly visitor friendly, as numbers are displayed only in Arabic numerals, the routes are unpublished and the buses themselves are often overcrowded. These buses have no orderly queue to board, in fact, quite the opposite and the bus rarely rolls to a complete stop, whether you are getting on or off. If you do make it on, at some point a conductor will manage to squeeze his way through to sell you your ticket. In Egypt, Taxis are certainly the cheapest and most efficient. All taxis have official markings and are different colors in different cities. Travelers should be wary of fake cabs which try to extort money from tourists. Some have meters, but most do not, so it is best to negotiate a price before departure to avoid conflict with the driver after the journey. The International Car Rental Companies are represented in Egypt, including Avis, Hertz, Europcar and Budget. Vehicles can be picked up from the local airport or through travel agencies. While the quality of the roads is generally good, the same cannot be said for the standard of driving. Travelers choosing to drive themselves should be particularly careful when commuting through the busier cities.